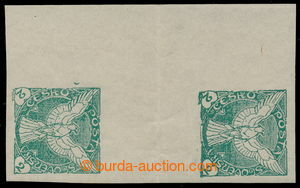 Pof.NV1Ms(2), Falcon 2h green, 2-stamps vertical gutter, folded, very rare distance between stamps 19mm (! ); repaired gum, certificate Vrba, exp. by Karasek., scarce! 1918 Pof.NV4Ms(4), Falcon 10h violet, 4-stamps vertcal gutter, folded, distance of stamps 30mm; hinged, exp. by Gilbert, Karasek, cat. 20.000CZK, rare!